We all want to cut our grocery bill. Before we do, though, we need to realize how much the food really costs. The most obvious way is to look at your bill over the month or year, discounting the non-food items. But as we’ll see below, this method has its pitfalls as well. Cost doesn’t tell the whole story. 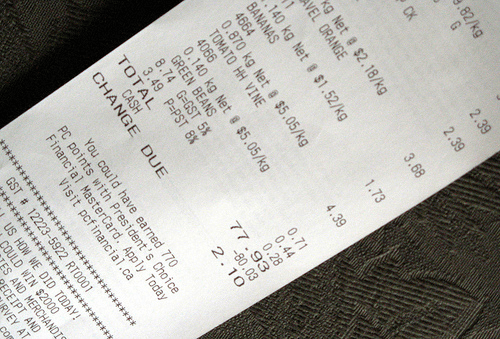 You can lower your food bill but end up getting less for your money. Sometimes the more expensive food turns out to be the bigger bargain. And we all have different definitions of value. For some people, the extra cost of organic vegetables is worth it to them. Other appreciate the value of high-quality oil or flour. Here are some things you need to take into account when you are comparing prices at the grocery store. Cost per serving. This is a simple way of looking at an item. A whole chicken might make you two, three, ten, or twenty servings, depending on how you cook it. It doesn’t matter if you calculate meals according to individuals or a family meal, as long as you are consistent. If you serve it with frozen peas, calculate how many servings you will get out of the package. Don’t forget leftovers. Calories. To maintain our weight, or in the case of children, to grow, we need a certain number of calories each day. There usually isn’t much variation in our caloric intake from day to day, and adding twenty extra grams of food a day would make us gain several pounds over the course of a year. Our food budget needs to cover the minimum amount of calories that we need. But food with excess calories should be avoided. Nutritional value. Very poor people will choose the cheapest calories, like white rice or flour, to satisfy their appetites. Foods like vegetables will be second choice, especially if they are hard to find or out of season. We should also look for a variety of foods as close to their natural state as possible. If brown rice costs the same as white (it should, but unfortunately doesn’t), brown is the better value because it has more vitamins and fiber. Cooking costs. To continue the analogy of brown rice vs. white, you’ll need to factor in the longer cooking time for brown rice. The cost can be reduced by using a pressure cooker, cooking in large quantities, or cooking in the same pot or oven with the other parts of a meal. You can buy pre-cooked brown rice, but it will usually cost more and be less nutritious. Convenience. Sometimes we do need to pay extra for convenience. If paying for the butcher to cut up the chicken means you’ll skip the grocery rotisserie chicken, it may be worth it. On the other hand, convenience often means lower value. All of the processing done in the factory means the food is less fresh and the vitamins have been lost. Adding vitamins, like in children’s foods, isn’t the same as getting them straight from the source. Unwanted extras. Often when we buy processed food we pay for extras that we don’t need. Some brands of cheap tomato paste contain glucose and fructose (sugars). I almost never add sugar to meals with tomatoes, but if I did I would want to be in control of the amount. And since tomatoes cost more than sugar it’s safe to assume that that sugar is overpriced. Other unwanted, cheap additives that you may or may not want include soy (in ground meat), starches (yogurts), corn (everything), food colors, preservatives, and sodium, and MSG. The cost of these foods to your health may never be known. Waste. Some of the food we buy ends up in the garbage. Using chicken skin and bones for stock will add value to your chicken, but if you don’t eat, they have no value for you. Hidden waste can come from buying more than we need (even if we eat it!). Disposal. If you live in an area where you pay according to the amount of garbage you generate, you’ll pay more attention to packaging. If you buy disposable garbage bags, more garbage may mean more expense. Convenience foods tend to have excess packaging, both for freshness and to take up more room on the shelf. My son noticed that the larger package of chips actually contained fewer grams of the product. Travel time and expense. If you are paying for fuel to get to the store, you must count this as part of your food expense. It can be cut down by making fewer trips, carpooling, or getting food delivered. Have I forgotten anything? What is important to you when you compare prices at the store? I found that sometimes its not worth buying the cheaper bigger item. Take grape juice, I used to buy the big bottle and my kids drank it all week long. Now I buy the smaller bottle which we finish over shabbos. Its worth it for my to buy 1 bottle per week than to have them drink it all week long. (I know I could try to hide it for the next week, but in my house that doesn’t work with grape juice). good post 🙂 Since we’re transitioning to an organic/whole foods diet right now, I do pay more for some of my food than what I used to-but I’ve also found ways to still get good deals. Examples of this are buying organic produce off of the reduced rack at my grocery store, buying organic bread at a local bread outlet instead of the regular grocery store, having a Costco membership where organic food is fairly cheap etc. I’m also going to plant my first garden this summer, which will supplement what I have to buy at the store. Sara – congrats on starting your own garden. If you are concerned about buying organic, concentrate on the “dirty dozen.” List vary by year and region, but generally include Peaches, Apples, Sweet Bell Peppers, Celery, Nectarines, Strawberries, Cherries, Pears, Grapes, Spinach, Lettuce, and Potatoes. Avoid paying extra for the least contaminated foods like Onions, Avocado, Pineapples, Mango, Asparagus, Kiwi Fruit, Bananas, Cabbage, and Broccoli. Thanks for the tip on the dirty dozen fruits and vegetables. I more often focus on organic or low-pesticide labeling for animal foods (milk, meat and eggs), because they tend to concentrate contaminants. It is worth it to me to pay more for meat if I know where and how it was raised and slaughtered, and trust that the animal was not fed anything unnecessary or unnatural. I know these types of options are not available to everyone, but it is well worth it to shop around. Great post. Hope to link to it at some point.